I have always been interested in family and knowing who everyone is and or was. It was only natural that I became the family Genealogist. I have collected and copied most of my mother's older family photo's that she inherited as the executor of her parents estate. I have also seen to restoring the ones that were a little rough. This was my first efforts at Photo Restoration. The first Photo I did was not to bad, but took me nearly 5 hours to restore. Now I could do even better quality work in about half an hour. I have restored dozens of our family photo's at this point and printed and shared them with the extended family. Some of them when they were younger caused the damage to the photo's (throwing darts at them, when mad) and now as they are older and have kid's of their own, appreciate the work and effort it took to put restored copies into their hands, to cherish. I have also collected the photo's from my father and his brother had all the old negatives which I went through and brought back to life. I have also met extended relatives/distant cousins on line and shared photo's. Again, I restored photo's they shared that needed the restoration. My father about 25 years ago bought a really nice camera with lenses and all sorts of attachments. I loved it and couldn't wait to use it. Later I was able to finally afford my own semi-professional camera. I bought a Canon DSLR Rebel a few years ago. I have been taking pictures whenever I can. On this site I will share the restorations I have done and some of the photo's I have taken. I am still quite the novice at using and taking photo's but i hope to continue learning and growing in my knowledge and love of photography. My son has taken an interest in photography also and he has taken some pretty good shots. If he wants to we'll share some of those too. After all that is what Genealogy and photography are all about, sharing the past through photo's and memories, and that is why I will always 'Remember When...."
Side by side The original on the left and the restoration on the right. This was one of the first photo's I restored. 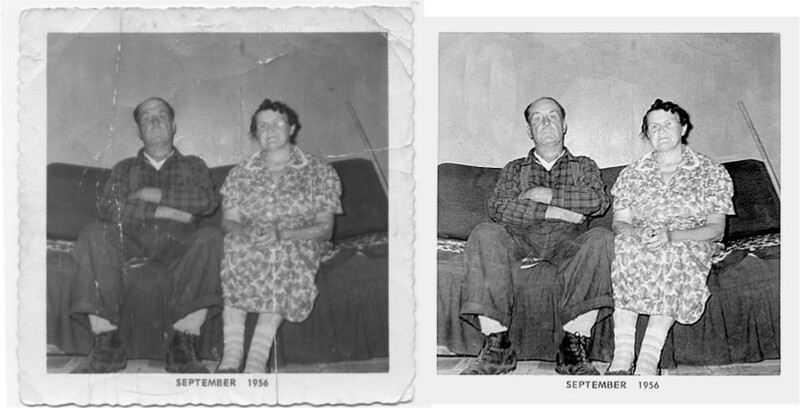 I have already posted the restored photo on my genealogy blog "Remember When Genealogy" . It is my great grandfather Eugene Lafleur and great grandmother Marie Louise (nee Trudel). Originally taken in 1956 after 40yrs of marriage.